Just got my tracking number from Wet Spot and it will arrive tomorrow. It will be housed in a 65B solo. Tank is filtered with an Aquaclear AC110, which is fully cycled since I rehomed the fish that were in it. The substrate is CaribSea River of Doubt sand. So far this is what its starting out to be. Still working on the decor, have another bag of sand to add for a bit deeper sandbed and some Mopani and rocks. Will update with pics when I get it aquascaped and the little guy comes in and . That's awesome! I'd recommend adding some large rocks, it will like to hide among them. And 65 is a very large tank for a Suvatti, if you want to downgrade to a 30 and move something else in the 65 it would be fine. I agree--even a 15g works for these sedentary species. You'll also want a 2-3" deep sand bed for burrowing. I am using the 65B because I have it, its paid for and I didnt need to buy anything. But I am tempted to get something since the $1 per gallon sale is going on at Petco again... lol. Wife would kill me if I bought another tank. I am running 3 at the moment (300g, 65B x2). Eventually I want to make a multiple tank rack to hold both my 65B's on top and 40B's on the bottom. Maybe something I might work on over the winter? @pufferjw, will look for some more rocks to add, thank you for the suggestion. Was not sure on the sand depth but will add more, thanks for that info @Pufferpunk. Pretty excited for this new guy. It was the first puffer I ever wanted but ended up with a hairy as my first puff since no arrowheads were available at the time. Probably for the better since my hairy puff is so friendly and outgoing. The little guy is here! They ship the puffers in a container with holes inside the bag because they like to bite through the bags! My second bag of sand also came in so I was able to deepen the sandbed a little. Maybe not enough for an adult but enough for this little guy for now. I added some rocks, driftwood and more plastic plants too. Last edited by PYRU on Wed Oct 10, 2018 3:14 pm, edited 1 time in total. Glad I could help! I know you have misssed your old Suvattii and been looking. Glad you got one too! Did you end up buying another tank at the $1 per gallon sale then? I just bought my filter and heater for pickup this afternoon. I'm either going to use the 29 I just bought for darts or get a 20L. Then I have to fight my jag for the bigger river rocks. Its going to probably mirror the congo setup. By the way if anyone's looking for something aqua imports has a nice selection of puffs. They have suvatti, golden, amazons, barbatus labeled as leirus, and some others. I know they have 1 barbatus out of 3 but I can't confirm the others. Im thinking of either getting a 29 or 40B on the sale... I really do like the extra tank space of the 65B to aquascape but if the Suvatti are that inactive then I really may consider a smaller tank. Had not thought about feeding the little guy, lol. My other puff eats krill and earthworms but is pretty tame at this point. This little guy might not be ready for dead so I might try earthworms or maybe run down to the beach and get a couple tiny shore crabs for him to hunt. The 40 breeder with a crossbrace from Seapora or Deep Blue (Aquarium Masters) is a lot better than a non braced 40 that is on sale. Non braced 40s are great for cheap sumps that hold half the water. Non braced bow out at the center/top. Save the few bucks for a braced 40 breeder and make one side have the light and the other side filled with low light anubias plants. I think the one side will have lots of pulling power for dirty water as the dark side still works as a plant filter, but also gives the puffer a chance to live in the dark side. 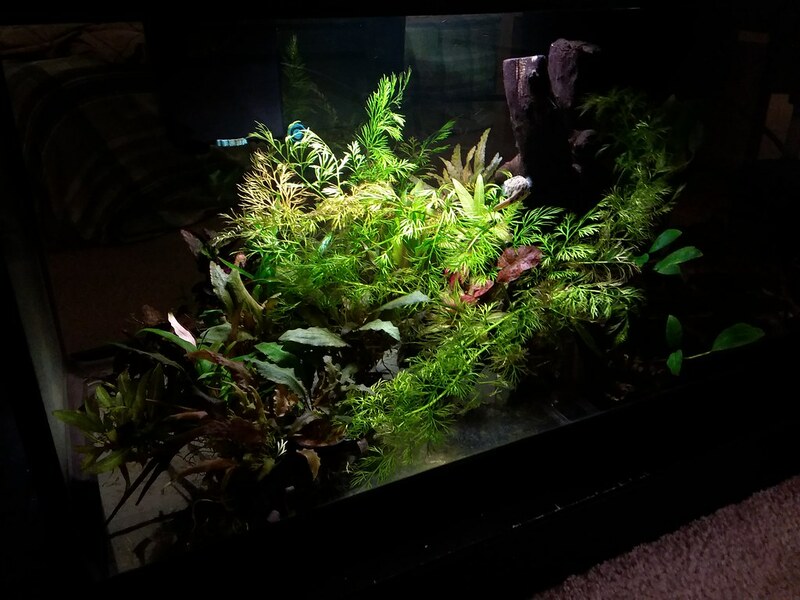 The tank is full of more plants today, as this is an old photo (below) of my 40 breeder. Your looking at the light half. The dark half is stocked with anubias as stated. Imo I would of went 20L or 29. I would have for the hairy as well though. I just now bought a 20L for mine coming in. My old one I had in a 40b though. It should eat earthworms once acclimated. I've had to resort to tieing a string around food and wiggling it around before though.